Picking up Edmonton Oilers Defenseman Darnell Nurse from the airport in a Ram 1500, it became obvious he likes trucks. Growing up, luxuries like new trucks were not part of Nurse’s normal life. His father, Richard Nurse, a former professional Canadian Football League wide receiver, made him work for everything. 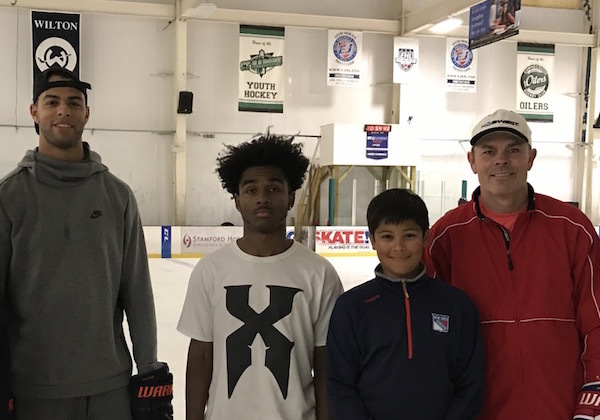 He came to South Norwalk, Connecticut, last Friday to pass on that work ethic to the kids from NextGen AAA. NextGen AAA (Achievement in Academics and Athletics) is a non-profit that provides opportunities to promising hockey players. All of the student-athletes come from families that can’t afford the tuition at most hockey programs or prep schools. NextGen AAA pays for their tuition and helps them with private tutoring in the classroom, as well as private hockey coaching in the off-season. On Friday, that coach was Nurse. Nurse believes that it’s important for athletes to be role models in the community. Growing up, he had no shortage of role models to admire: his father, of course, as well as his mother, Cathy, who played basketball in college. He also looked up to his uncle, former Philadelphia Eagles quarterback Donovan McNabb. What Nurse learned as a kid in a house full of athletes and high achievers (his younger sister, Kia, is a two-time NCAA basketball champion as a member of the Connecticut Huskies) was that whatever you plan to do in life, you have to support yourself. It was a lesson he learned at the age of seven and has been with him ever since. Nurse said that despite his size and strength—he’s 6' 4" without skates on—he knew that in order to succeed in the NHL, he would need to practice as much as possible and figure out ways to keep getting better. That’s why he works with a private coach himself in the off-season. Like other NHL players, Nurse trains with NHL Hall of Famer Adam Oates, who introduced Nurse to NextGen AAA. Just as Oates is in Nurse’s corner, Nurse hopes to help many aspiring hockey players who don’t easily have access to the sport, like the NextGen AAA kids. This season, Nurse will start his own foundation that will help collect and distribute much-needed equipment to kids in need.